This is pretty cool. There are some baby bald eagles about to hatch, within the next 24 hours. They have a really high quality webcam on them. Enjoy. I have been watching this for 8 hours now. I took the midnight over/under. I got her up on my other monitor, full screen. It's cool to see momma breathing. There are some other cool cameras there too. I hope the eggs crack before I got to bed, but I doubt it. 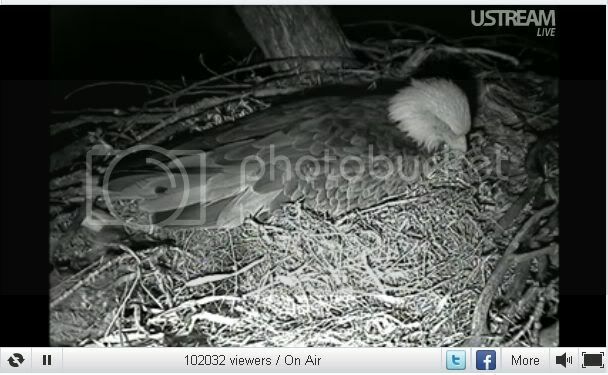 15,006 of us are watching an eagle being asleep. It reminds me of Big Brother. I never knew the miracle of birth was so boring. Us mammals have a knack for making things interesting, though. I found a HD version here. Bearing in mind the date, I expect Rick Astley to pop out from under the eagle at any minute. They just swapped over, all three eggs have initial chips out, will be sometime today. Now at 113,738 viewers, plus one large black cat on my knee. ^Best tell kitty not to get ideas, they're a lot bigger than they look. This is lovely, thanks for the link Stargate. Can someone pm me when they hatch? Not hatched yet, but the eagle is pulling grass tightly around itself, as the wind is blowing like hell. Eagles have really made a huge comeback in the last 30 years. What beautiful birds they are. Sort of like watching grass grow or paint to dry. I don't know, they eat a lot of road kill. I would expect a gamier taste, like pheasant or possum. Oh my, a raccoon in the tree? in the nest!!!!??? The eagle did wink at me just now so maybe we are getting close. Is the show for westerners only? Well, maybe someone can record it and post on Pictures Forum. Until then I have to stick to your verbal accounts. You can't see anything? So far you missed a eagle sitting in a nest.